The conventional thinking on Amyotrophic lateral sclerosis (ALS) is that it is a progressive disease for which there is no effective treatment and no way to slow the decline or reverse its deadly effects. I disagree. There is considerable scientific evidence that the environment is a major factor in the setting of ALS. There is also evidence that diet matters, that autoimmune processes are at work, and that toxin exposure is a factor. Changing the foods we consume and the choices we make each day can influence all these factors and affect disease progression. I have had remarkable success in my own life, reversing 7 years of steady decline due to progressive MS by changing my diet and physical activity. I have used the same interventions on others with progressive multiple sclerosis or relapsing-remitting MS, successfully reducing the severity of fatigue and improving quality of life. I expect the same principles would likely be beneficial for those with ALS. I have written a book, The Wahls Protocol: A Radical New Way to Treat All Chronic Autoimmune Conditions Using Paleo Principles, which describes the interventions I have used in our clinical trials and in our clinics. I have thousands of followers on Facebook (Terry Wahls MD) and have had multiple individuals with ALS contact me to tell me that following my diet and lifestyle principles has helped slow, and in some cases, arrest the decline. Why would diet and lifestyle changes make a difference to ALS patients? A lifetime of diet and lifestyle choices and environmental factors interact with an individual’s genes to create the environment that allows ALS to develop. While you cannot change your genes, you can change what you eat and what you do. That alone will change which genes are active and which are silent, and will likely have a major impact on your current symptoms. Here is the scientific rationale behind those observations as well as references that show the prior papers that underlie my conclusion. ALS causes the death of neuron cells that control voluntary muscles. The disease is associated with stiff muscles, muscle atrophy, muscle twitching, steadily declining strength, and worsening disability. Symptoms may start in one limb, with bulbar symptoms (problems speaking or swallowing), or more rarely with breathing problems. Approximately 5 to 10% of ALS cases are directly inherited from parents, with the remaining 90 to 95% considered sporadic. In the sporadic cases there appears to be a complex interaction between environmental exposures and genetic vulnerability that contributes to the development of ALS, the severity of symptoms at initial diagnosis, and speed of decline. The environmental factors that have been shown to increase the risk of developing ALS include previous exposure to heavy metals (mercury and lead), pesticides and other organophosphates, and/or organic solvents and history of electrical shock, traumatic brain injury, and physical injury. Epidemiologic evidence linking viral infections and ALS has not been documented to date[2, 3]. Modifiable risk factors that influence the risk of developing ALS and the speed of decline have been identified. Smoking increases the risk, while diets higher in vegetable and fruit intake and omega-3 fatty rich foods[3-5,6] lower the risk of developing ALS and slow the speed of the decline. In addition autoimmune processes have been identified as a potential factor in the development of ALS[7, 8]. There is a case report of an individual who was initially believed to have a motor neuron disease, possibly ALS, whose symptoms, physical findings, and laboratory findings regressed over a 23 month period while following a gluten-free diet. In a subsequent case control study, Gadoth found that a higher percent of individuals with ALS (59.1%) than controls (28.6%) had HLA specific alleles that increase the risk of developing Celiac disease. All controls had no evidence for IgA antibodies to transglutaminase or gliadin (antibodies associated with Celiac disease or gluten sensitivity), while 15.3% of the ALS patients did have elevated auto-antibodies, suggesting that gluten sensitivity may be a factor for some individuals with ALS. Other autoimmune diagnoses and processes have been noted in the presence of ALS. Other autoimmune diagnoses that have preceded the diagnosis of ALS include asthma, lupus, celiac disease, myasthenia gravis, polymyositis, Sjögren’s syndrome, and ulcerative colitis, and systemic lupus erythematosus has presented as ALS[11-13]. In previous pilot studies we have utilized a modified Paleolithic diet as part of a multimodal regimen [14, 15] in a single arm, non-randomized study in the setting of progressive multiple sclerosis (MS) or as the sole intervention in a randomized wait list control study in the setting of relapsing-remitting multiple sclerosis. In both study types, multiple sclerosis–related fatigue decreased measurably. In addition, I have a social media presence where I advocate for dietary approaches to reducing symptoms and improving quality of life in people with chronic neurological, neurodegenerative, and autoimmune disorders. I have been contacted by persons through social media who have ALS, have adopted the modified Paleolithic diet, and have experienced an improved quality of life when they stay compliant with the modified Paleolithic diet. Based on the favorable experience in the pilot studies in the setting of relapsing-remitting multiple sclerosis and the individual favorable reports in the setting of ALS, I have developed a protocol for a study of the impact of a modified Paleolithic diet and stress-reducing practices in the setting of ALS. The interventions in this study are centered on diet and lifestyle and based on Functional Medicine principles. Functional Medicine addresses the interaction of genetic vulnerability and environmental factors, particularly diet and lifestyle, that contribute to 70 to 90% of the risk of developing chronic disease. The root causes of poor health: toxin body burden, hormone disruption, inadequate digestion and assimilation of nutrients, structural damage, infection, dysbiosis, and microbiome compromise are addressed with the patient using motivational interviewing and patient activation. We will be using the same study diet that I use in my MS research studies and describe in my book, The Wahls Protocol: A Radical New Way to Treat All Chronic Autoimmune Conditions Using Paleo Principles, The study intervention will utilize motivational interviewing techniques[17, 18], which stress self-determination, to assist participants in identifying and amplifying their internal motivation to adopt the recommended diet and stress-reducing practices. 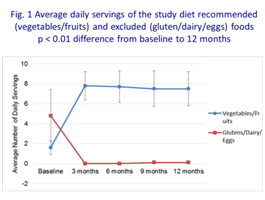 Because the dietary interventions have been associated with reduced MS symptoms (improved energy, reduced pain, and improved mental clarity), we have been remarkably successful at having subjects eliminate the excluded foods from their diet (gluten-containing grains, casein-containing dairy products, and eggs) and add the encouraged foods (green leafy vegetables, sulfur-rich vegetables, and deeply pigmented vegetables and berries, and omega 3­–rich foods). People could not sustain such a major change long term if they did not also experience marked reduction in symptoms. See Figure 1. I am currently seeking funding for this study and am optimistic that we can secure full support. If you are interested in supporting the project, please contact Alli Ingman (allison-ingman@uiowa.edu) at the University of Iowa Foundation. For anyone with a neurodegenerative disorder of any type, there is considerable potential benefit from adopting the dietary and lifestyle protocols that we have been using in our study of MS. The good news is that I have written books for the public to teach people why and how to make these changes. If you want to begin implementing the concepts that I use in the MS clinical trials I conduct and am proposing for the ALS trial, pick up a copy of The Wahls Protocol: A Radical New Way to Treat All Chronic Autoimmune Conditions Using Paleo Principles, and work with your primary care doctor to implement as much of the protocol as you and your family can. I have also written the companion cookbook, The Wahls Protocol Cooking for Life. In this book I provide guidance on how to easily and affordably implement the protocol (both in terms of money and time). When you order the cookbook, you’ll receive links to free resources to get you started on implementing the program and your journey back to health. Milonas I: Amyotrophic lateral sclerosis: an introduction. J Neurol 1998, 245 Suppl 2:S1-3. Talbott EO, Malek AM, Lacomis D: The epidemiology of amyotrophic lateral sclerosis. Handb Clin Neurol 2016, 138:225-238. Wang MD, Little J, Gomes J, Cashman NR, Krewski D: Identification of risk factors associated with onset and progression of amyotrophic lateral sclerosis using systematic review and meta-analysis. Neurotoxicology 2016. Okamoto K, Kihira T, Kobashi G, Washio M, Sasaki S, Yokoyama T, Miyake Y, Sakamoto N, Inaba Y, Nagai M: Fruit and vegetable intake and risk of amyotrophic lateral sclerosis in Japan. Neuroepidemiology 2009, 32(4):251-256. Jin Y, Oh K, Oh SI, Baek H, Kim SH, Park Y: Dietary intake of fruits and beta-carotene is negatively associated with amyotrophic lateral sclerosis risk in Koreans: a case-control study. Nutr Neurosci 2014, 17(3):104-108. Fitzgerald KC, O’Reilly EJ, Falcone GJ, McCullough ML, Park Y, Kolonel LN, Ascherio A: Dietary omega-3 polyunsaturated fatty acid intake and risk for amyotrophic lateral sclerosis. JAMA neurology 2014, 71(9):1102-1110. Appel SH, Smith RG, Engelhardt JI, Stefani E: Evidence for autoimmunity in amyotrophic lateral sclerosis. J Neurol Sci 1994, 124 Suppl:14-19. Appel SH, Smith RG, Engelhardt JI, Stefani E: Evidence for autoimmunity in amyotrophic lateral sclerosis. J Neurol Sci 1993, 118(2):169-174. Brown KJ, Jewells V, Herfarth H, Castillo M: White matter lesions suggestive of amyotrophic lateral sclerosis attributed to celiac disease. AJNR Am J Neuroradiol 2010, 31(5):880-881. Gadoth A, Nefussy B, Bleiberg M, Klein T, Artman I, Drory VE: Transglutaminase 6 Antibodies in the Serum of Patients With Amyotrophic Lateral Sclerosis. JAMA neurology 2015, 72(6):676-681. Rao TV, Tharakan JK, Jacob PC: Systemic lupus erythematosus presenting as amyotrophic lateral sclerosis. Clin Neuropathol 2004, 23(3):99-101. Maldonado ME, Williams RC, Jr., Adair JC, Hart BL, Gregg L, Sibbitt WL, Jr.: Neuropsychiatric systemic lupus erythematosus presenting as amyotrophic lateral sclerosis. J Rheumatol 2002, 29(3):633-635. Turner MR, Goldacre R, Ramagopalan S, Talbot K, Goldacre MJ: Autoimmune disease preceding amyotrophic lateral sclerosis: an epidemiologic study. Neurology 2013, 81(14):1222-1225. Bisht B, Darling WG, Grossmann RE, Shivapour ET, Lutgendorf SK, Snetselaar LG, Hall MJ, Zimmerman MB, Wahls TL: A multimodal intervention for patients with secondary progressive multiple sclerosis: feasibility and effect on fatigue. J Altern Complement Med 2014, 20(5):347-355. Bisht B, Darling WG, Shivapour ET, Lutgendorf SK, Snetselaar LG, Chenard CA, Wahls TL: Multimodal intervention improves fatigue and quality of life of subjects with progressive multiple sclerosis: a pilot study. Degenerative Neurological and Neuromuscular Disease 2015, 2015(5):19-35. Irish AK EC, Wahls TL, Stenselaar LG, Darling WG: Randomized control trial evaluation of a modified Paleolithic dietary intervention in the treatment of relapsing-remitting multiple sclerosis: a pilot study. Degenerative Neurological and Neuromuscular Disease 2017 2017:18. Coyne N CD: Effectiveness of motivational interviewing to improve chronic condition self-management: what does the research show us? Home healthcare nurse 2014, 32(1):4. Vansteenkiste M1 WG, Resnicow K.: ward systematic integration between self-determination theory and motivational interviewing as examples of top-down and bottom-up intervention development: autonomy or volition as a fundamental theoretical principle. The international journal of behavioral nutrition and physical activity 2012, March (9). Dr. Terry Wahls is a clinical professor of medicine at the University of Iowa where she teaches internal medicine residents, sees patients in a traumatic brain injury clinic and a therapeutic lifestyle clinic for those with complex chronic disease. In addition she conducts clinical trials testing the efficacy of diet and lifestyle to treat chronic disease. She is also a patient with secondary progressive multiple sclerosis, which confined her to a tilt-recline wheelchair for four years. Dr. Wahls restored her health using a diet and lifestyle program she designed specifically for her brain and her mitochondria and now pedals her bike to work each day. She is the author of The Wahls Protocol: How I Beat Progressive MS Using Paleo Principles and Functional Medicine and the paperback, The Wahls Protocol A Radical New Way to Treat All Chronic Autoimmune Conditions Using Paleo Principles and teaches the public and medical community about the healing power of intensive nutrition. Follow Dr. Wahls on Facebook. Follow her on twitter at @TerryWahls. Dr. Wahls is conducting clinical trials testing the effect of nutrition and lifestyle interventions to treat MS. She is also committed to teaching the public and medical community about the healing power of the Paleo diet and therapeutic lifestyle changes to restore health and vitality to our citizens. 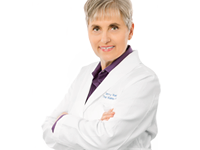 To learn more about Dr. Wahl's research, visit her website: www.TerryWahls.com. Thank you for your awesome testimony and the work you’ve put in to helping change lives. I lived in Cedar Rapids for over sixteen years but am originally from Mississippi. My mother was diagnosed with ALS in the spring of this year and has had some horrible challenges. The doctors haven’t offered much hope either. Is it possible that my mother and I could speak with you to get some clarity on dietary recommendations? She has been trying to stay close to the dietary changes that Dr. Axe recommends for people suffering with ALS. However, the disease is steadily progressing. We’re very desperate for healing. please contact Dr Wahls at her website.